Group customs are pretty popular right now in the indie nail community. There are a lot of them I have admired even though there is no way I could afford to buy them all. When I saw Sara, the maker of Cupcake Polish, announce she was doing a group custom duo I was pretty excited. Cupcake Polish makes some of my favorite holographic polishes and I was even more excited when I saw the inspiration photos for the duo. Sarah created two awesome and super saturated shades for the Cupcake Polish Lovers Facebook group. Both have incredible formulas lots of depth. I wanted to wait to post this to allow some time for current group members to purchase the customs before I posted about them here. But don’t worry! You still have plenty of time to purchase these. 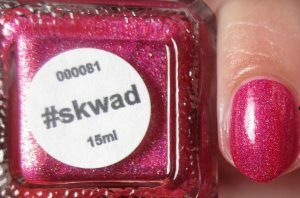 #Skwad is a super saturated cool toned fuchsia. It leans cooler toned than my photos show but my macro photo is closer to the actual color. The formula does lean a bit on the thicker side which is pretty typical for Cupcake Polish. However, it is still very easy to work with and is fully opaque in two coats. Top coat helps to bring out the holographic in #Skwad as well as the hint of gold shimmer. The gold shimmer looks a lot stronger in the bottle than it does on the nail and even though I’m a big shimmer fan I’m okay with this. I feel like a strong shimmer would take away from the beautiful bright color in this case. I do want to give a heads up that you’ll want to wear a good basecoat with this. My nails are a bit porous right now due to a bad experience with a sticky basecoat (That’s a story for another post.) I had a bit of temporary staining on the skin and nail with #Skwad so just take your usual stain blocking precautions and you should be fine. 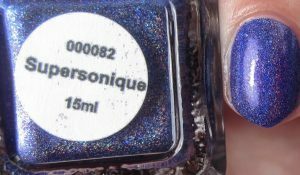 Supersonique is a super vivid cool toned purple. It reminds me of a slightly darker and more saturated version of Lilac You Mean It. If you have Lilac You Mean It you will still be fine having Supersonique because they are different enough to not be dupes. Supersonique leans more on the indigo side than Lilac You Mean It does but is still very purple. This has a pretty similar formula to #Skwad and was opaque in two coats. The holographic in Supersonique is more intense than #Skwad and it has turquoise blue holographic sparks in it that stand out especially when you topcoat it. Again, you’ll want to watch out for staining with this one, especially if you have porous nails. I had purple tips for a few days, but ags I said, my tips are a bit damaged due to that crummy sticky basecoat incident. Basecoat is your friend! Just might want to avoid the sticky variety for these because the pigment doesn’t need any help sticking. I really love these two polishes a lot. Oddly, I think I slightly prefer #Skwad which is funny because I was positive Supersonique would be the obvious favorite for me. Since I’m a terrible enabler I think you should really get both. I really love it when Cupcake Polish does these bright colors and it’s nice to have a bright that isn’t a neon. Both polishes benefit from having a glossy topcoat worn over them but topcoat also intensifies the color. I don’t mind that topcoat does this but it’s something to be aware of. You can only purchase these polishes through the Cupcake Nail Polish Lovers facebook group. They are available until July 14th so hope to it if you want them. I highly recommend them especially if you are a fan of bright, super saturated, nail polish like me. If you could only pick one which do you think you would choose? Or are you like me have no self control when it comes to polishes like this? CrowsToes is a not a new indie brand by any means but is simply new to me. Shimmers are starting to come back which makes me very happy and I love that CrowsToes has some offerings for folks like me who still love multichromes. I have bought a handful of polishes from them s I will be showing them off gradually instead of doing one big post. First up is, arguably, one of CrowsToes most popular multichromes, Indian Summer. At first I didn’t really think I needed Indian Summer because it looked a lot like ILNP’s Cygnus Loop. The two polishes have the same color shift and do look pretty similar. I think Indian Summer may be slightly more saturated. The biggest difference I found is Indian Summer has a much stronger magenta shift between the royal purple and red. It still has that royal purple, magenta, red, to copper shift to it that Cygnus Loop does. If you have Cygnus Loop you may be able to skip this one, unless you are a multichrome nut like me. If you wan more of that magenta shift between the purple and red you’ll want Indian Summer. Indian Summer had a smooth, easy to use, formula that dried fairly quickly. There are a bit of brush strokes when you first apply the polish but most of them disappeared once the polish was fully dried. Topcoat will also help to smooth out those remaining brush strokes. Just for reference’s sake, my photos were taken without topcoat so you could see the polish in its natural state. It took 3 coats for Indian Summer to be fully opaque on its own. Like with other multichromes you will be able to get it opaque in one coat. Sometimes I find adding the black base is more work unless you have a really nice one coat black polish. Some people say black base makes the color shift in multichromes stronger. I have not noticed that personally but it’s worth a shot if you want to save on polish. This was the first time I have really been happy with my photos of a multichrome polish. I’ve found multichromes to be in the top three polish finishes to photograph because it’s not easy to capture the color shift and to capture the full spectrum of color shift takes some serious acrobatics with your posing and lighting. I’m disappointed I wasn’t able to capture the copper shift. It’s definitely there in person if you angle your fingers the right way. You are going to mostly see the royal purple, magenta, and red shifts. I have been really pleased with the turn around time and customer service from CrowsToes. I have made two purchases from their website so far and both times my orders shipped in a timely manner, I received shipping notices and tracking. Everything arrived well packed and I liked that rubber bands that matched he caps were included for each polish. The smooth, short, caps were a bit difficult to open. However, CrowsToes is switching over to matte caps which I’m pretty happy about since they will be easier to grip. What do you think? Are you happy to see makers still making multichromes?